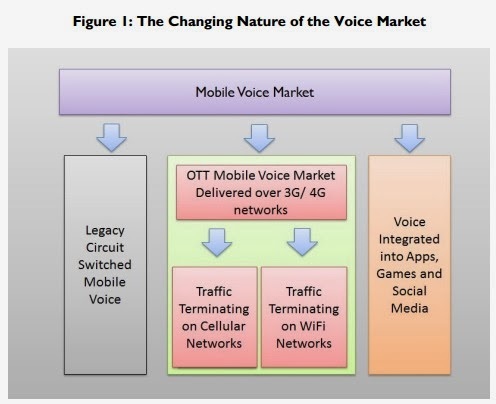 Voice services, despite increased competition and the threat of new technologies, remains the most important revenue generator for all but a handful of mobile network operators worldwide. However, voice revenues face immense pressure and will continue to be eroded, prompting providers to create new offerings. Mobile network operators will generate revenues of close to $20 billion by 2018 through strategies involving internet based voice or carrier OTT services, according to the latest market study by Juniper Research. These Internet voice revenues will be derived from new service propositions and bundles delivered through partnerships with stand-alone OTT (Over The Top) service providers. The Juniper study found that while OTT service providers have been successful in creating impressive user bases of mVoIP customers, many future revenue generating strategies are likely to involve traditional mobile service providers that have a billing relationship with the end-user and guaranteed QoS (Quality of Service). "OTT providers are turning to traditional carriers and vice versa. Together they are forming partnerships to create genuinely new service propositions, such as the ability to port a number across several devices," said Anthony Cox, Associate Analyst at Juniper Research. The study findings also observes that stand-alone mobile VoIP players are becoming increasingly sophisticated in their service offerings and are developing more ways to monetize services. Meanwhile, VoLTE (Voice over LTE) will see widespread adoption among MNOs for the increased network efficiency it affords the operator, even though direct revenues will be low. Standard Circuit switched revenues will decline overall though this will be partially offset by new OTT revenues. A clear winner, Tango, has emerged in the market for OTT mobile video calling though as a sector mobile video calling is still on the starting blocks. Systems Integrators and software specialists such as Kineto and Amdocs will become increasingly important in creating OTT monetization strategies for multinational operators.